Tybee is the kind of place where visitors can kick off their shoes, let their hair down and exhale. Its also the kind of place where kids can ride their bikes to a local ice cream parlor and where families can spend quality time together. Looking for Tybee Island Attractions! 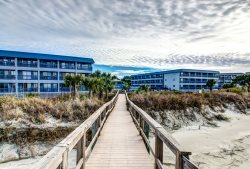 Take a look below to find all of Tybee�s local attractions. On the South end of Tybee you have the pier and pavilion where you will find fishermen and families strolling above the ocean and listening to music; on the North end of Tybee you have Fort Screven, which is the site of the Tybee Lighthouse, Museum and several old batteries. Nearby Fort Pulaski is great for nature lovers with biking, walking and birding. Tybee Island offers lots of Charters and Tour options. Professional Tybee Island Dolphin Tour Guides are experienced in leading you to the best possible dolphin viewing sites in our area! Get close to natural dolphin feeding areas with the dolphins, turtles, and other wildlife often within just a few feet away. When your guide locates these Atlantic bottlenose dolphins they carefully guide you closer in to see this amazing and mammal in its natural habitat. Sometimes they are so close you�ll be splashed as they leap right by in a playful state! Love to fish? There are no limits on the types of fishing you can try on Tybee Island. Fish from piers, the beach, or take a deep sea charter. Cast your line into the Atlantic Ocean and bring out a catch that can be a vacation fish story you won�t soon forget. Be sure to get back to nature on Tybee with a guided eco tour through the beautiful salt marshes. Learn about the local flora and fauna and maybe go on a fossil hunt too! There is simply no better way to explore the beaches of Tybee Island than by riding a bike. There are many different rental options for both adults and children. Are you traveling with an infant or a toddler? If so, then remember that you can rent transportation on Tybee Island for the little ones as well. Do not worry yourself over umbrellas, beach chairs, coolers, or other beach supplies You can get them right on the Island. In fact, everything that you need for a perfect day at the beach is right here. Water Sports are a great way to get out on Tybee�s waters! Tybee Island has several companies offering Kayak, Jet Ski, Stand Up Paddle boarding and Surfing rentals and instruction. Whether you want to paddle your way through one of Tybee Island�s exhilarating kayak tours or zoom off on a Jet Ski your bound to have a blast on Tybee Island! Savannah area is the perfect destination for the golf enthusiast. So many great gold courses in the area from Donald Ross design to the famed PGA tour course HArbor Town.